WHY BUY LOCAL FROM SAVE STORES? SAVE Stores will GUARANTEE Portland customers the best price ANYWHERE. Along with the best price comes the most extensive benefit package in the country, not just the Portland area, all for FREE!!! SAVE Stores will provide FREE mastery lessons on your new machine for anyone who uses your machine. 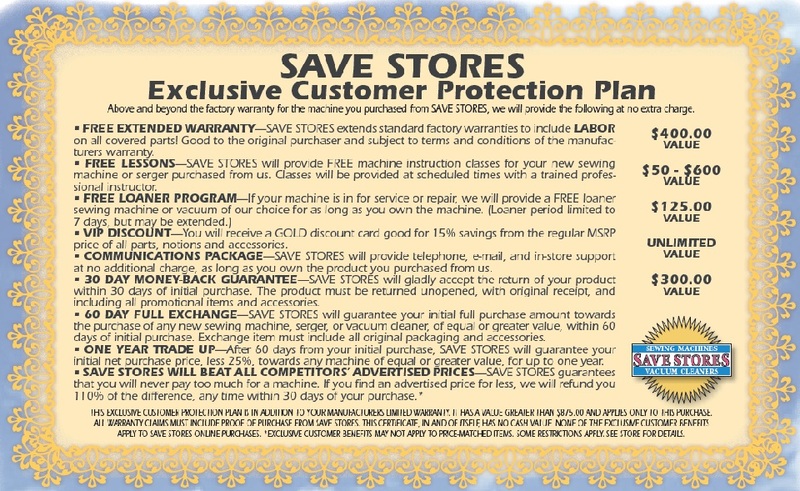 You will also receive a SAVE Stores "Gold Savings Club" card that guarantees 15% off anything at retail price. Portland customers purchasing from SAVE Stores will always SAVE money. In addition, our communication package is provided at no additional charge. You can call, e-mail or stop by SAVE Stores and recieve support on your machine for as long as you own it. SAVE Stores carries only the best products at any price point. Don't take our word for it; SAVE Stores is the only place in the North West to compare Bernina, Brother, Janome and Singer side by side. We feel so stongly about the quality and longevity of our products that SAVE Stores will provide Portland owners an extended warranty on your machine that covers labor for ALL warranty repairs for the full factory warranty. This could be as long as 25 years! SAVE Stores has been in business since 1960 and will be there incase you or your machine needs us. SAVE Stores is the only dealer in Oregon to have a stated 30 day return policy, a full 60 day exchange and a one year trade-up program. We feel strongly that our knowledgable staff will find the machine that fits your needs. If your needs change, we want to be there to help. SAVE Stores does not sell fabric. Instead, we put our only focus on the Sales, Instruction and Servicing of sewing machines. You wouldn't buy a car where you buy your wiper blades? Why would you buy a sewing machine where you buy fabric? 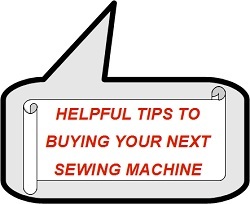 Make your sewing machine purchase from a place that has YOUR sewing machine as their only focus. Meet your new dealer face to face and SAVE! !